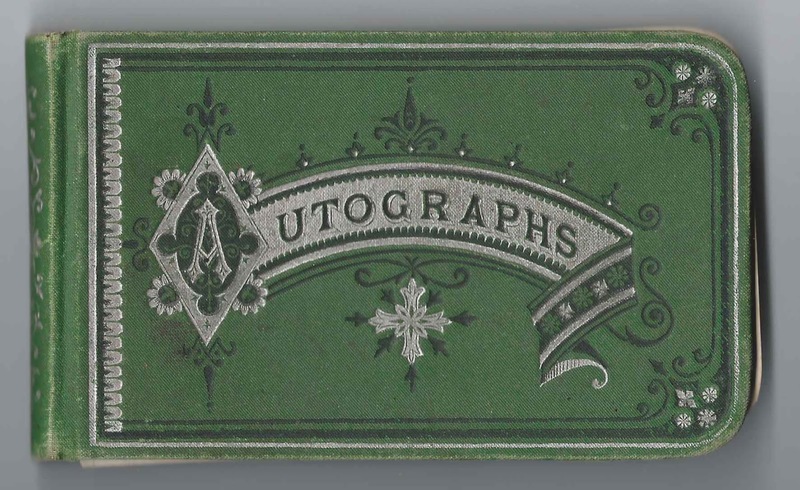 1870s-1890s autograph album that belonged to Mary A. Lewis of the Village of New Hope in Niles, New York. 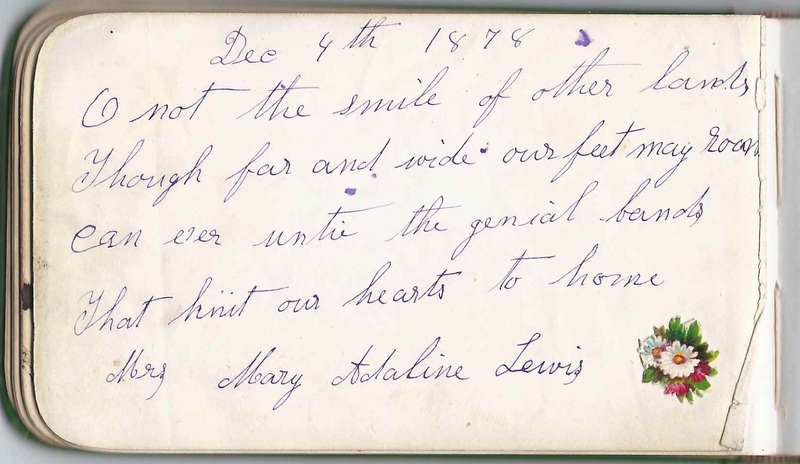 The album is approximately 6-1/4" x 3" and contains the sentiments of 69 of Mary's relatives, schoolmates and friends. Many of her paternal Lewis relatives and maternal Baker relatives inscribed pages in the album. An alphabetical list of the signers appears at the end of this list. Mary A. Lewis was born about March 1858, the daughter of Benjamin Franklin Lewis, Sr., and Mary Adaline (Baker) Lewis. 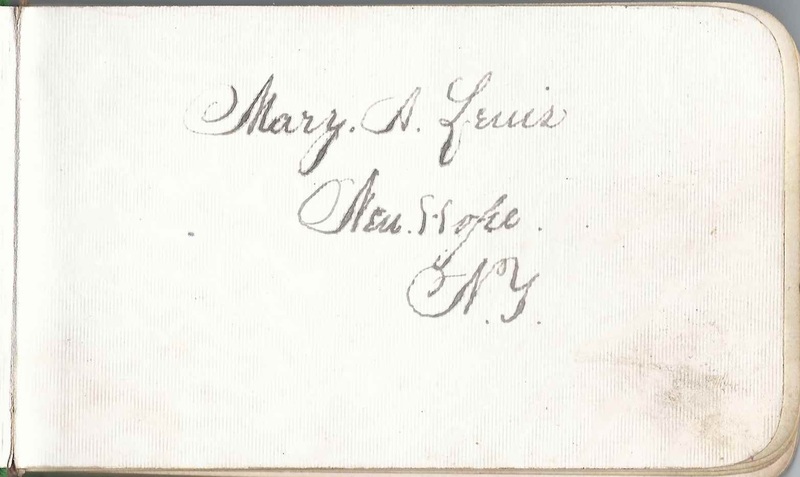 Mary's mother signed a page in her album on December 4, 1878. December 4, 1878 sounds like it was a day of family gathering, as several Lewis and Baker folks signed pages on that day. I think the B. ? 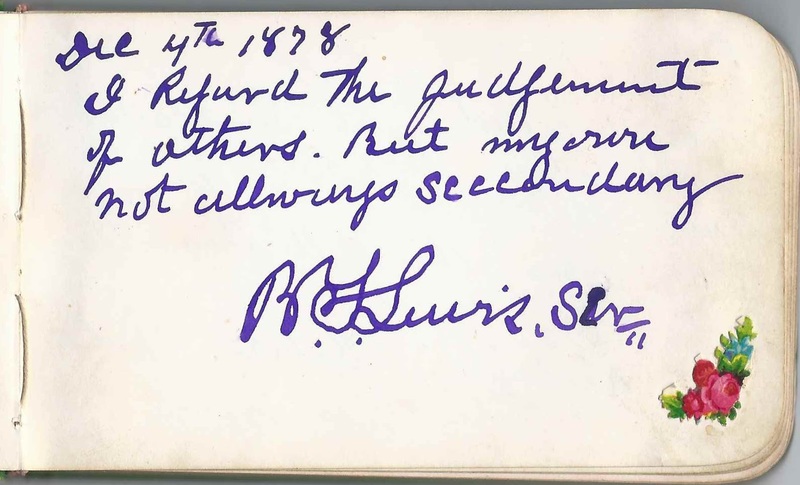 Lewis who signed one of the first pages in Mary's album was her father Benjamin Franklin Lewis, Sr., who signed his page on December 4, 1878. 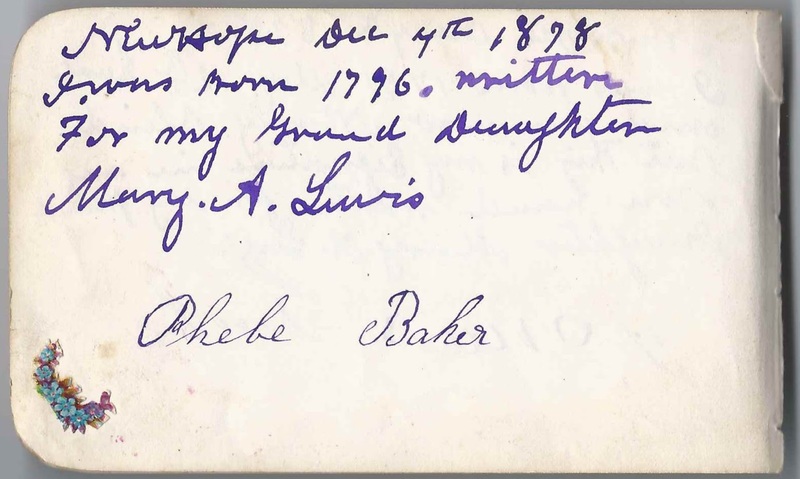 Mary's maternal grandparents, Jonas and Phebe (Smith) Baker signed pages in her album, both at New Hope, New York, on December 4, 1878. Jonas noted his birth year of 1791. He would live until 1884. Phebe died in 1881. 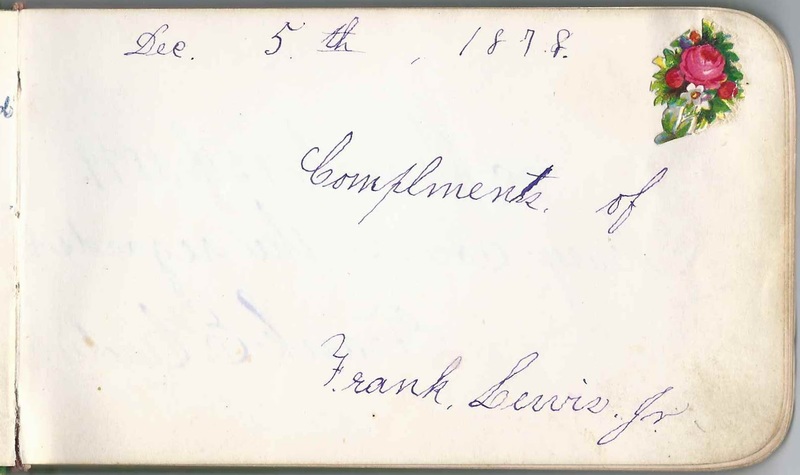 I believe the Frank Lewis, Jr., who signed a page on December 5, 1878, was Mary's brother Benjamin Franklin Lewis, Jr. In the 1900 Census of Niles, New York, Mary A. Lewis was listed as living in the household of her maternal aunt Matilda Baker; Mary's widowed father Benjamin Franklin Lewis, Sr., was also in the household. Mary isn't listed in the plot with her parents and brother Frank at the New Hope Cemetery. There is a Mary A. Lewis buried there, but her birth year is 1866, unless this is a transcription error. Mary may have married after 1900. Jonas Baker, signed at New Hope, New York, on December 4, 1878. " I was born 1791 May 12, ? and am now nearly blind but this is my signature in my own hand written for my granddaughter Mary A. Lewis." 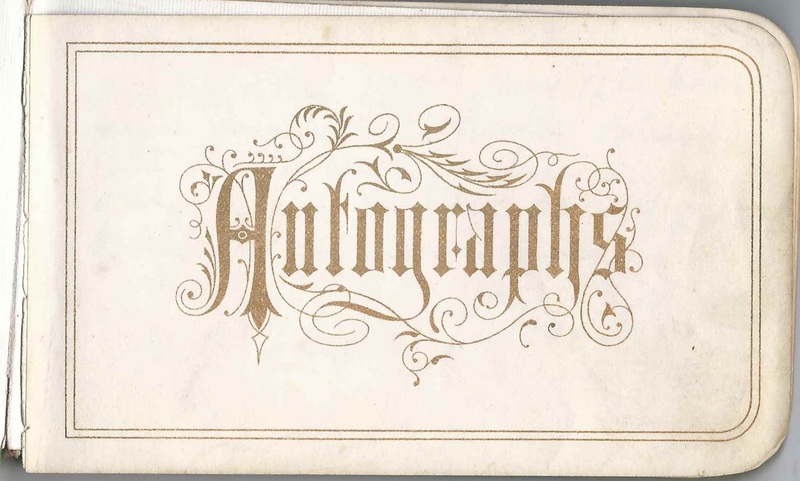 His wife Phebe (Smith) Baker also signed a page in the album. Phebe Baker, signed at New Hope, New York, on December 4, 1878. "I was born 1796. Written for my Grand Daughter Mary A. Lewis." She was Phebe (Smith) Baker; her husband Jonas Baker also signed a page in the album. Mrs. J. H. Baker; her husband Anson S. Baker signed the right facing page. Anson S. Baker; his wife Jane H. (?) Baker signed the left facing page. Anson was a brother to Mary's mother, Mary Adaline (Baker) Lewis. B. Lewis, Sr., signed on December 4, 1878; not sure of middle initial; but presumably Benjamin Franklin Lewis, Mary's father. His wife Mary Adaline (Baker) Lewis signed a page farther in the album. 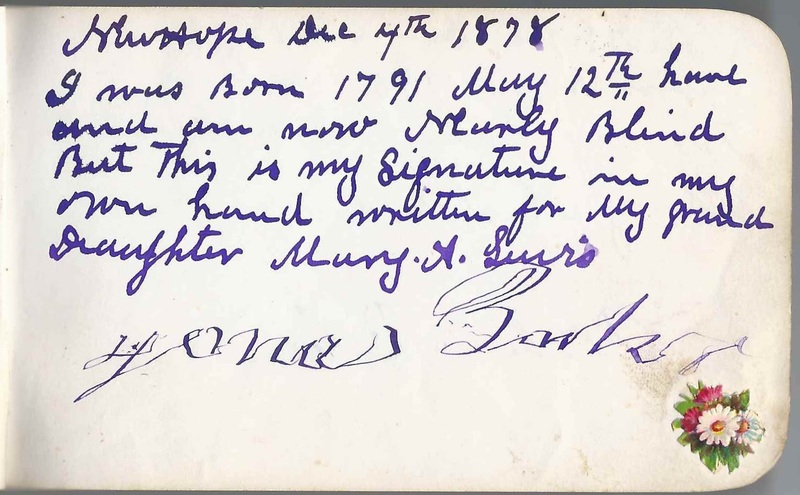 Frank Lewis, Jr., signed on December 5, 1878, Presumably this was Mary's brother Benjamin Franklin Lewis, Jr.
Mary Adaline Lewis, signed on December 4, 1878; Mary A. Lewis' mother, Mary Adaline (Baker) Lewis; her husband Benjamin Franklin Lewis, Sr., also signed a page. Hattie Elster is the daughter of David Elster. They were from New Hope Niles, NY. Thank you for that extra information. I'm adding it to the post, in bold with a credit to your comment. Oh, should have mentioned - if you'd like me to send you a scan of the page Hattie signed, please contact me. My email address is at top.